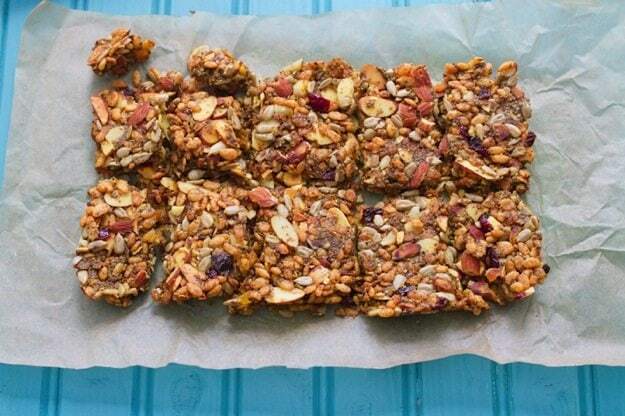 Low sugar almond granola bars spiced up with curry powder. They’re sweet, savory and absolutely delicious. In other news, I have quite the recipe to share with you today. 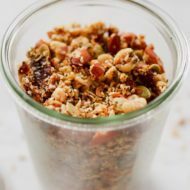 It’s my latest granola obsession and the flavors are perfect for fall! 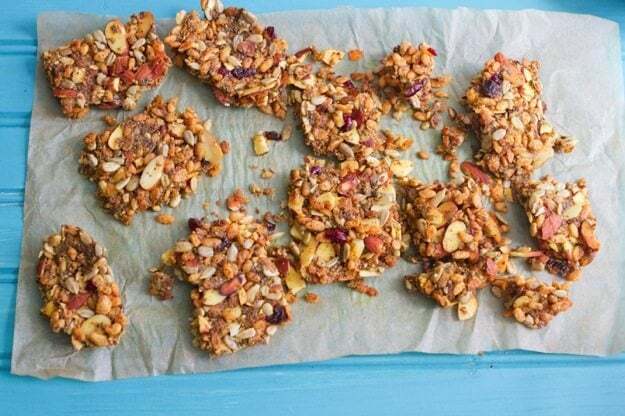 I have granola bars in the recipe title but as you’ll see from the recipe they can be granola bars, granola chunks or plain ole granola. No matter which way you serve it, the recipe is ridiculously delicious and that’s really all that matters in my book. 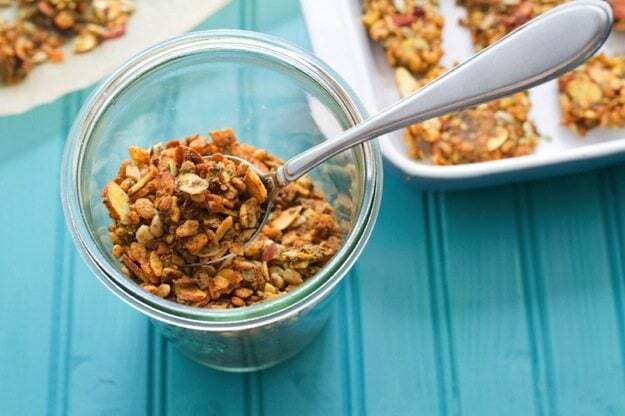 I’ve posted several granola and granola bar recipes here on EBF but this one is quite unique. For one, no oats are involved. It’s also got the sweet and savory combo going on and it’s really crunchy rather than chewy. In case you didn’t know, I LOVE LOVE LOVE crunchy things — nuts, charred roasted veggies, crispy sweet potato fries, muffin tops, cereal, carrots, wasabi peas, veggie chips — bring on that crunch! 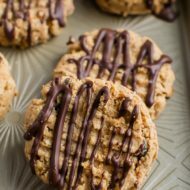 Needless to say, this recipe has the crunch factor that I adore! The flavor reminds me of Chivda or Bombay mix. If you’ve never had Bombay mix it’s basically an Indian snack mix, like Chex Mix but with Indian spices. I’ve had Indian snack mixes before and liked them so it’s no surprise that I love the flavor of this recipe. It’s got the curry and turmeric, a hint of spice from chili powder and cayenne as well as a bit of sweetness from the dried fruit and maple syrup. The sweet and spicy flavor is warming and perfect for the cooler fall temps. As for the texture — is irresistibly crunchy (almost like a cracker). The crunch comes from the brown rice crisp cereal, almonds and sunflower seeds. 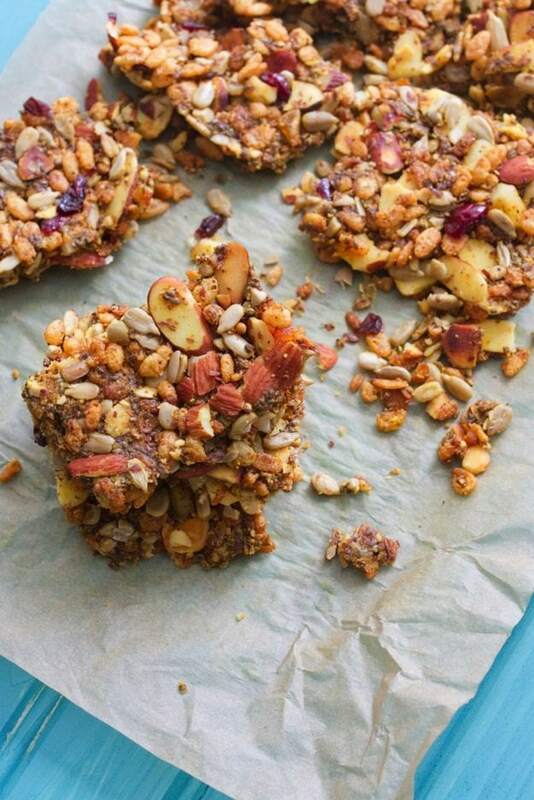 The best part is that the granola bars are held together by chia and flaxseed (healthy fats!) and they’re surprisingly low in added oil and sugar (which isn’t usually the case when it comes to snack mixes)! I can’t take credit for this as an original recipe — I got the idea from Chef Matthew Accarrino. These bars are one of the dishes he prepared for us at the cooking demo, which was part of the almond tour I attended a few weeks ago. I changed a few things, but the basic recipe came from him. Isaac and I enjoyed these bars on their own as a snack, but I also loved sprinkling the granola chunks over yogurt. It was especially amazing paired with Noosa’s new pumpkin yogurt. Curry granola + pumpkin ygourt = OMG amazing! Just a side note: I’ve used crispy brown rice cereal in a few of my recipes recently, namely the Crispy Baked Chicken Tenders, and had a few people ask about the cereal. Basically it’s just a healthy version of Rice Krispies. The plain varieties are gluten-free, low in sugar and have that same snap, crackle, pop that you’re used to. 🙂 You can find a box on the cereal aisle — Whole Foods sells their own brand, which I buy often. I also like Erewhon brand, which you can find at most health food stores. Grease or line a small rectangular baking sheet with parchment paper. I used a small rectangular baking dish (7 1/2″ X 5 1/2″). You could also you an 1/8th baking sheet (9″ X 6″). Combine ground flaxseed and chia in a small container and pour hot water over mixture and set aside. Melt almond butter and coconut oil on the stove, and stir in maple syrup. Add flax/chia mixture. In a large bowl, combine all remaining ingredients. Stir in the wet mixture and pack into your prepared pan. Use your hands or the back of a spatula to really press the mixture down. Bake for 25-35 minutes or until bars are browning a bit. Cut the bars while still warm and then leave out to cool for about 30 minutes. You can even put them in the fridge or freezer to cool if you’d like. Some of the bars will hold together better than others. At this point you can eat them as is or break the bars apart into chunks and eat as granola. If you want the granola to be even more crunchy, break apart and place back into the oven for another 5-7 minutes. Remove, let cool and enjoy! Brittany! This is a crazy flavor combo that NEEDS to happen in my life. You are so clever! These look amazing! I so envy your almond tour. I love the way you described the change in season! You totally hit the nail on the head. Thank you for the info on the brown rice cereal. I have a few of your recipes marked as ones I want to make ASAP. That flavor combo is so unique and sounds delicious! Oh yay! How’s the Whole30 going? 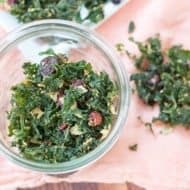 I’ve always been intrigued by it but as someone that likes plant-based food more than meat, not sure if I could survive! Woo-hoo! Hope you love them. 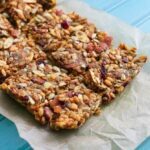 You can never have too many granola bar recipes–and I love the unique twist to this one! These look amazing Brittany! I’ve really been into savory snack lately and this would definitely fit the bill! These bars sound wonderful! 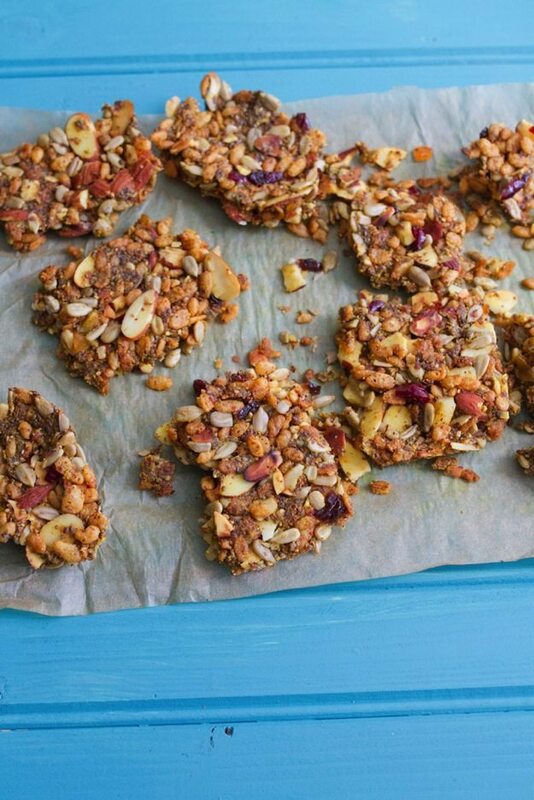 I loooove homemade granola/bars. The seasonings and all the crunchy goodness? Yes, please! 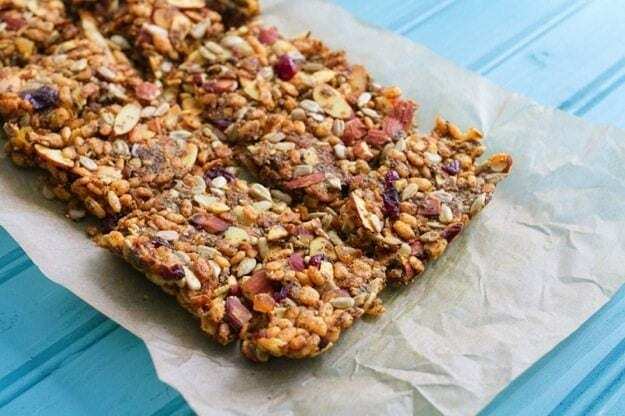 These look delicious, I love granola bars! I definitely prefer to make them myself.